The Flooding Review by Sir Michael Pitt into this year's unprecedented flooding in Britain has now been published and strongly recommended that 'planning for flooding should have the same priority as terrorism or flu prevention' from the Government downwards, and also 'urged local government and emergency services to improve their knowledge and practices'. 'The review looked at the lessons to be learnt from the floods and highlights a long list of failings. - no systematic stockpiling of emergency equipment, such as boats. According to the report, the floods in June and July led to the biggest loss of critical infrastructure since World War II. "We're all facing up to climate change and there are all sorts of implications for the country in terms of having to adapt to that change," Sir Michael Pitt said. "As the report explains, during May, June and July this was the highest level of rainfall we've ever recorded in this country since the 18th Century, so understandably there were very high volumes of water and big implications for emergency services." "That needs to be sorted out and that is one of our urgent recommendations". or see the Pitt Review Executive Summary here. 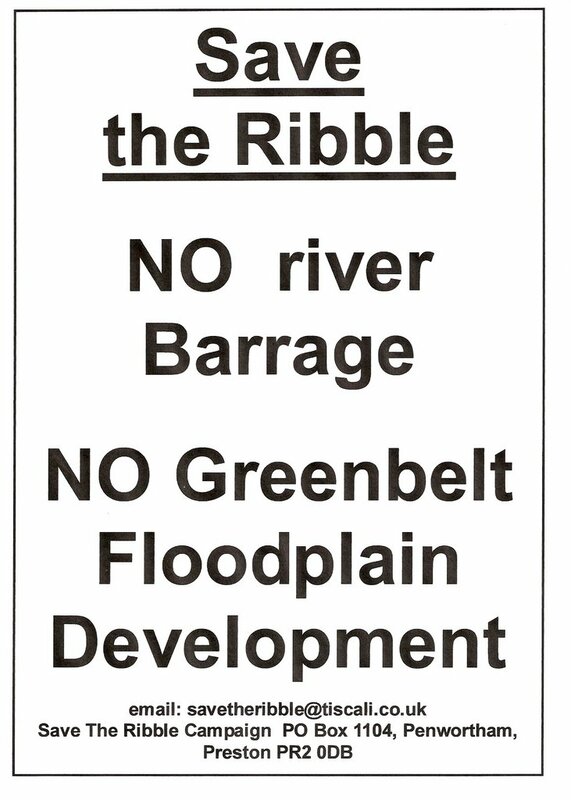 Since his initial announcement at the Public Meeting organised by Save The Ribble and Riversway councillors on 20th November, Cllr Hudson has since made statements to the Lancashire Evening Post, and to Radio Lancashire just this week, which confirm this position. Today, the Lancashire Evening Post report on the confusion about the December edition of the council's Prestonian magazine which has just landed on tens of thousands of doormats this week, and features an article about Riverworks which states that "one aspect of the Riverworks exercise will be to look into the feasibility... of constructing a barrage across the river". 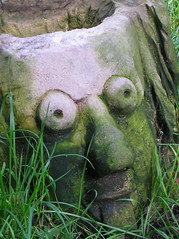 The LEP do, however, quote Preston City Council Chief Executive Jim Carr as saying that "Deadlines are to blame here. The magazine was sent to the printers on November 16th and the article reflects the position at that time". During the Radio Lancashire interview on Tuesday of this week, Cllr Hudson, Jane Brunning of Save The Ribble, and Dave Dunlop of the Wildlife Trust were asked about the Riverworks scheme. "Riverworks is a totally visionary concept for the whole of this part of Preston: unfortunately it has been hi-jacked by one single thing, the barrage, so we've moved away from that and are concentrating on Quayside [the Docks] and Canalside. 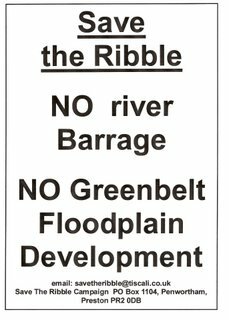 We will leave Riverside to South Ribble's vision of the future for the river". "It has been scaled down: we've listened to people and their concerns. We would have liked some form of study to find out whether any of these concerns were justified but we've said that... [this administration] wouldn't do anything about Riverside, we'd concentrate at this moment in time on the Docks and the Canal..."
"Anything which puts the Ribble barrage in the bin rather than on the back-burner is to be welcomed", and said "we need to work with nature rather than against nature in terms of what developments we take forwards into the future". 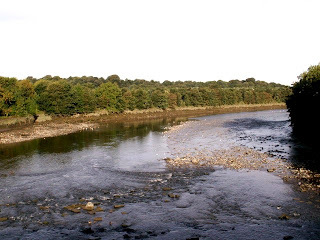 Jane said that the flooding risks on the Ribble are not from the sea but from rainwater, so a Thames-style flood defence would not help here, and pointed out why a barrage would actually increase floodrisks as well as impact on an internationally important intertidal ecosystem. She also pointed out that for many local people, the river and riverside areas are already an important leisure resource, as well as an important floodplain (which is another reason it should never be developed on) and that we should make the most of what we've got, ensuring great facilities for local people and even providing attractions for the new Ribble Coast & Wetlands Regional Park. Dave Dunlop of the Wildlife Trust told Radio Lancashire about many of the important habitats and species that depend on the Ribble, and also said that returning some of the Green Belt into Blue Belt - Wetland marshes - would improve the river's function, increase floodplain provision, and provide great facilities. Cllr Hudson is due to make an official statement to the next full council meeting on 20th December: we will, of course, report what happens here. 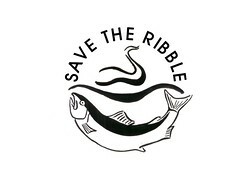 Over the coming weeks and months, Save The Ribble Campaign will continue to monitor events, and will continue to campaign to Save The Ribble - FOR EVER. Watch this space to see whether the hopes and aspirations of local people for our river and riverside spaces will come to fruition: so many Ribblesiders have told us what THEY would like to see happen to the river and riverside spaces - keeping Nature green and clean and accessible to us all! "The key message is that flooding is a risk and people who live in this area should start now to prepare for what they would do if their property was flooded." Whilst, as the Lancashire Evening Post report, the risks of a serious flood event in Broadgate and Penwortham are deemed to be approximately a one-in-75 year risk, this does mean we are at high risk - and that such an event may not wait 75 years before it arrives! Lower Penwortham residents will also have a chance to find out about the new flood warning scheme from the Environment Agency at the Penwortham Area Committee in Kingsfold Community Centre Tuesday 4th December at 7pm. If you miss either forum, the Environment Agency will be sending letters out to local residents explaining how you can register for the scheme, or you can click on the link here to find out more. After this year of unprecedented rainfall in the North West, our higher than average and faster than average flowing river HAS taken the strain as it is a free-flowing, natural drain which copes with the rainfall from 1,490 square miles of the North West. THIS IS ONE OF THE MANY REASONS WHY BARRAGING THE RIBBLE IS A BAD IDEA. if these were mainly covered with the houses and concrete of roads and driveways and car parks for the "Central Park" building development being proposed for the Riverworks scheme, these large areas of valuable green space would not have been able to hold the many millions of gallons of water they are still coping with and releasing slowly into the river - all of our communities would have undoubtedly suffered greater flooding and the Ribble would have struggled to cope with the faster run-off of these rain waters. As the winter months are living up to predictions with yet more rainfall, Ribbleside communities are at even higher floodrisk this Winter - so register for the Environment Agency's flood warning scheme NOW and make a plan of action. Get sandbags just in case, plot a quick plan of action for getting the children and the cat upstairs, and your most precious belongings: hopefully we won't need to take any action as the Ribble and our floodplains have served us well this year but with the excessive levels of rainfall, the Environment Agency have given us a timely warning that it doesn't pay to be complacent.